Well, I always got a little jealous when I'd hear about people finding Gibsons in someone's trash, one time a guy told me about finding his Martin D-35 in the garbage in the '60s. After which I threw up. So I finally got my own little story. 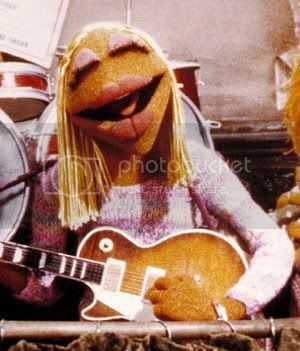 Driving by someone's garbage, I saw an Epiphone headstock sticking out...I figured it was just a neck but I turned around and said what the hell, and gave a tug. Out came a whole guitar. HA! Everything's there. Only two strings that evidenced way high action but otherwise intact. The back and sides look great...I felt around inside and I can't make the top move along the cracks, I don't think they go through. Please tell me more about this guitar. solid top, solid back, laminate sides? I know it's a Japan guitar but someone cut the bottom of the tag off (I think) which I thought odd. There are two metal braces inside (??? ), so it's been messed with. The neck is a screw-on, so the bad action can be fixed pretty easy, right? Is it worth just refinishing the top, and do they make a replica rosette decal if I go that route? OR just leave it and get the neck angle fixed. I do like these old Epiphones...is this a OOO size? I collect player guitars, got a couple old Gibsons which I love to play. Pictures are worth a thousand words, so...here's three, including one inside (of the metal brace)! They really just threw it away? I wonder why they didn't take it to a luthier first. My advice is to take to a luthier and have them take a once over. They may be able to fix it for you on the spot. Honestly, I wish I could tell you what to do more than that. I normally don't take a hand in fixing my own guitars (simply because I'd rather not screw it up), so that's honestly what I would do. But from the pictures the guitar looks savable. Even if they say it can't be fixed, you have a nice new piece of furniture and an interesting story to back it up. I doubt that it's unsalvageable though. I've seen bands break their guitar on stage, take it in for repairs, and it's fixed! I just don't understand why you would ever throw away a guitar though. I have a stratocaster that's pretty beat up and (at this time) not playable, but I wouldn't throw it away. It still has some sentimental values. Anyways, let us know what happens and post pics of the final outcome! Please find attached the specs. I cannot imagine the metal bracing that's addressing whatever issues the top had can allow for a great-sounding guitar as is. Do they make a replica rosette decal like that? Maybe Stew-Mac or somewhere? I'm going to take it in. I wish I was competent to do guitar repairs myself but generally I am not. Man, the money I could have saved over the years...sigh. Are the sides and back laminates? The back sure does look like one solid piece of wood because the grain pattern on back I can see inside the guitar. The sides...I'm not so sure. I also assume the top is solid spruce? It doesn't look like a laminate looking at the soundhole edges. I did some more surfing (of this forum) today and found some old threads that went into pretty good detail about these early Japan guitars. BUT also found a good thread about what goes commonly wrong the neck block on these guitars...which was real helpful and now I think I'm starting to imagine the repair history of this guitar before I found it in it's nearly final resting place (the compactor of a garbage truck). I may just try to mess this one myself after all, what the hell. nothing to lose, it was free. OK I may have missed something but that sticker said Kalamazoo MI. Was this not made at the gibson factory? A close look at the picture of the tag reveals an uneven cut along the bottom with just the top of the "AN" letters where they cut off the "MADE IN JAPAN" printing. Besides, my surfing around reveals that the 6832 was not made in the states...one of the first Japan guitars. No solid wood, all laminate materials. 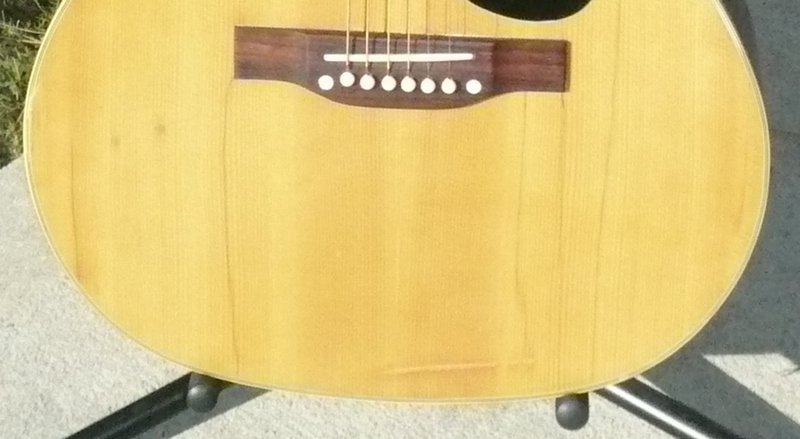 Some refer to this as a 000 model, similar in shape to the Martin model number 000 "triple ought". This was the first model nomenclature used when Epiphone production was moved to Matsumoku of Japan in late 1971. These early Norlin guitars, made under contract by Matsumoku of Japan, can be dated to within a 6 month period at the end of 1971. In early 1972 this model was dubbed, FT135. The rosette is OEM. These labels are commonly altered to disguise their Japanese origin with the expectation of passing them off as older, more valuable guitars. (as if the HomeDepot aluminum channels wouldn't detract from the value) Not sure what issues these channels were installed to correct. From their position, I'd say a bellied up bridge due to cracked/loose "X" braces. The 'splint' where the major "X" braces cross is not original. Original construction has these "X" braces notched to cross each other in the middle, while being one piece from end to end. The intersection was reinforced with a bit of fabric or gauze gluing them together. The usual malady afflicting these Norlin era FT guitars is a loose neck block, which this one appears to have suffered, as evidenced by the chunk of soundboard and rosette missing at the base of the fretboard. It appears to have been repaired. If the action is still high, quite poorly, I might add. Also missing is the adjustable saddle holder. These are nigh on impossible to replace or replicate. Better to plug the extra wide saddle slot with rosewood looking wood, then re-cutting for a standard saddle, or making or buying an over sized saddle (1/4" thick). There appears to be some sort of apparatus at the base of the neck block showing through the sound hole. (more HomeDepot repair aluminum?) Can you get a camera/mirror in there to show the neck block repair? In case you haven't found it, > > Here is my repair < < Depending on the extent of earlier repairs and choice of glue, my repair may or may not be possible. If the action is high, and the glue used was epoxy, you have a mighty fine wall hanger... and not much else. You may be able to salvage the tuners or the neck, if it is still removable. If the neck is removable, you can experiment with shims and wedges to get the action to an acceptable level. Not sure how the after market truss work will affect the tone. Only time will tell. I have the original bridge, it's just not pictured. I did talk to a guy who said he has absolutely seen that type of bracing (the aluminum U-channels pictured) on these Epiphones before. But I don't know, those two pearl dots on the bridge (covering however the U-channel is affixed to the bridge) make me wonder. But I don't care really. I think it's a classic neck-block problem like you say and from what I've read. Let's see if it fixes...thanks! Good luck with her. I have an FT-135. Block inlays. My luthier reset the block and it plays great. Bought mine in a pawn shop in Dallas in 1980 for $75. Today she sounds and plays better than a $75 guitar. Some of the Matsumokus are not that bad. Just getting one and make her playable. I say this guitar is worth 50 bucks...but even these Japan Epiphones, and my buddy has a early 12-string I've played at his house for years, play like 100 bucks. So we're ahead if it fixes. These old Epiphones have their own thing going on and I love the sound for what they are. PS yes it could be worth the fix and I would leave the rosette the way it is. Holy Epiphone Batman! That's MY 6832! I bought it off eBay in 2016 and restored it! Check out the top cracks and the horizontal scratch. I stumbled on this 2012 thread today looking for more info on the 6832. When Tom Dodson looked at it he couldn't understand the aluminum channel rod braces under the bridge. When he removed them it became apparent why they where installed: the bridge plate had cracked. And no, they are NOT factory!! It was $135 just to make and install a new one. I had Tom do it. He made a maple one like a D-28 Martin has and glued it in. Worked beautifully. Once the bridge plate was fixed, Tom reglued the neck block, added some cleats to fix the top cracks, filed & re-slotted the bridge, and installed a bone saddle & Fishman Infinity pickup. Note: The black mass on the neck block is the Fishman 9v battery nylon case. Easier to change batteries when put there. The repair cost was far more than the 6832 is worth. Add in the cost of the Fishman Infinity pickup & a 000 hard case and it's even more expensive. Since this was a guitar I had & sold when I was in the Army way back in 1972, I wanted a gigable one. That I have now . I was into top hats long before Slash ever even picked up a guitar ! Thanks for the surprising update. What a wild full-circle story! Wonder if the OP ever got his up and running. I would be the one who sold it on ebay. Glad to see things worked out...I didn't have the skills for all that repair work! 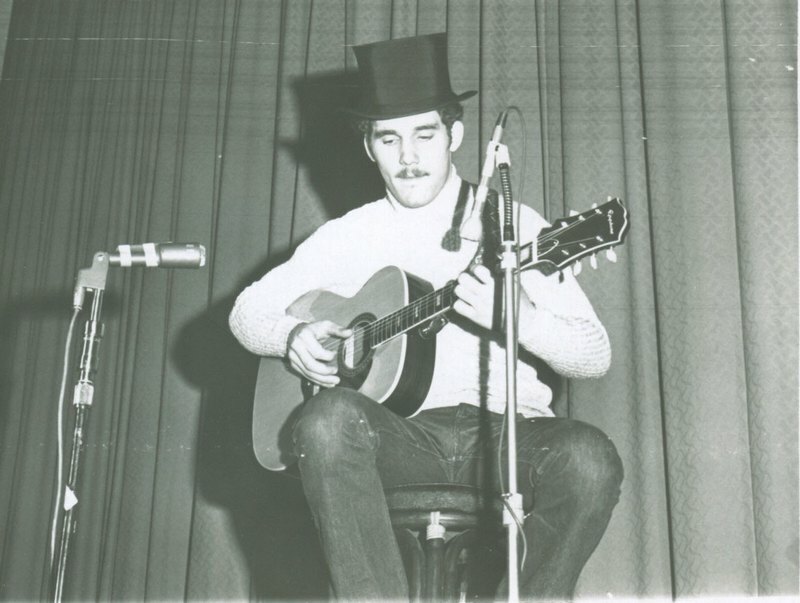 It's the same guitar throughout this thread (except for pre-Slash-top-hat pic from 1973!). As the OP just posted, he sold it on ebay to Aoresteen, who ended up doing the restoration. Yes this thread has gone full circle. This 6832 guitar now sits in my bedroom on a stand so I can play it more often. It sounds good and is easy to play - set up with 0.012s. Truly a labor of love. Would I do it again? No, now that I have a 6832 and a restored FT-135 - no need for a third 'OOO'. Should both of those get stolen I would start the hunt over. No joke. It is amazing what some folks will toss away. No Gibsons, but my best trash can find remains a pre-War Regal jumbo 12 string. Same guitar that is pictured in the 1939-40 catalog.